VERY FINE. A RARE AND DESIRABLE COMPLETE PAGE FROM A ROOSEVELT PRESENTATION ALBUM WITH THE 1861 FIRST DESIGNS AND COLORS. 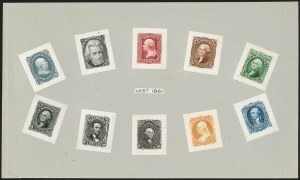 VERY FINE COMPLETE PAGE OF THE 1861 ISSUE SMALL DIE PROOFS FROM A ROOSEVELT PRESENTATION ALBUM. 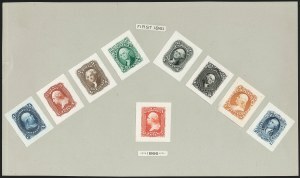 Only 85 albums were produced and few sets of the 1861 Issue proofs are intact on their entire original page. VERY FINE. THIS IS THE MOST COMPLETE SET OF 1861 ISSUE PANAMA-PACIFIC SMALL DIE PROOFS WE HAVE EVER ENCOUNTERED. ESPECIALLY DESIRABLE WITH BOTH SHADES OF THE 3-CENT, AND THE 5-CENT AND 12-CENT FIRST DESIGNS. From February 20 to December 4, 1915, the Panama-Pacific Exposition was held in San Francisco, to commemorate Balboa's discovery of the Pacific Ocean and to celebrate the opening of one of mankind's greatest engineering achievements, the Panama Canal. The Post Office Department decided to prepare a limited number of proof sets showing every United States stamp printed up to the time of the exposition. A total of 413 different designs were made. Only two sets were officially prepared, but it is widely recognized that between three and five of each were made. These included Officials, Newspapers and Periodicals, Philippines and other special use stamps. This set is the most complete we have ever offered for the 1861 Issue. It includes, in order of denomination, Nos. 63P2a, 73P2a, 65P2a, 74P2a, 57P2a, 68P2a, 59P2a, 69P2a, 77P2a, 70P2a, 71P2a and 72P2a. It lacks only the 3c and 90c First Designs (56P2a and 62P2a) and the 5c Second Design (76P2a) among all the Scott-listed Panama-Pacific die proofs. This is a rare opportunity to acquire a set of Panama-Pacific small die proofs representing all ten of the denominations issued between 1861 and 1866.